Catalog users (including users of Canvas Network) can drop courses or programs from the Catalog dashboard. You can only drop a course while it is in progress, which means the course is between the course start date and end date. If your course or enrollment status has concluded, you can no longer drop the course. Catalog users can also drop programs as well. 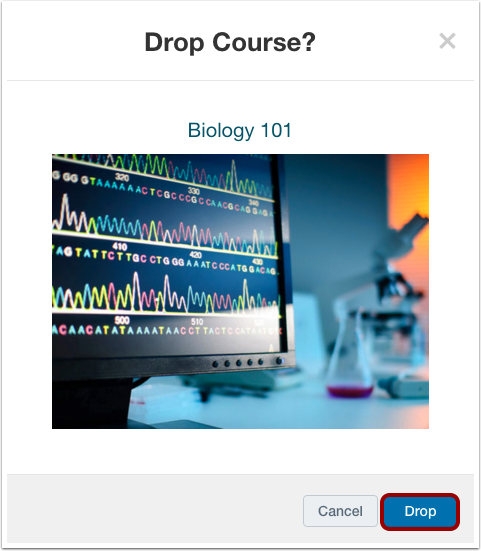 Courses can only be dropped if you enrolled in the course directly through your institution's Catalog. If you were manually added to the course by an instructor or admin, you will have to ask the instructor or admin to remove you from the course. In the In Progress tab, locate the course or program and click the Settings icon . Click the Drop Course or Program link . Catalog will confirm you want to drop the course or program. Click the Drop button. Previous Topic:How do I begin a catalog course or program? Next Topic:How do I view the certificate of completion for a Catalog course or program? Table of Contents > All Users > How do I drop a Canvas Network or Catalog course or program?